At Mary’s Tack & Feed we sell horse blankets & sheets dozens of times a week so we’ve got lots of experience & are ready to assist you. Getting the right fit shouldn’t be tough; let’s get started! So you’ve got a horse that needs a blanket or sheet. But how do you measure your fellow for the best fit? Blankets are measured & sized to fit the length of his body from center of his chest to just before the tail. So height doesn’t have much to do with what size to purchase but length has everything to do with correct size! Height does matter with the style. We will address height after correctly measuring your horse for that new blanket. Because most soft measuring tapes are just 60” long please note you’ll only go that far with the tape; mark that spot & then continue to measure. So be prepared to mark that midway point with finger or chalk & then lastly add the 2 measurements together. Some customers prefer to use one long piece of twine & then measure the length of the twine. 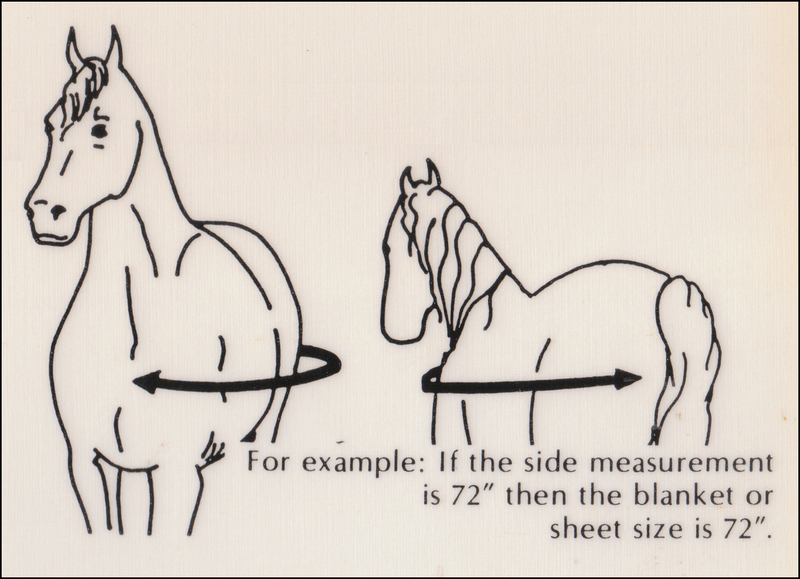 The figure below shows best how to measure your horse. Measure along the length of his body going across the widest part of his shoulder to where you’ll just meet the tail. Here’s where some folks make a mistake – do not measure to the middle of the tail. As you measure make sure the measuring tape stays level & taut. So now you know your horse blanket measurements are for a 78” blanket. You’re not quite home free yet! Here is where we’ll address height & style or “cut” of blanket. Euro cut blankets typically measure in 3” increments (i.e. 69”, 72”, 75”, 78”, 81″ etc.) and feature shoulder gussets, a smaller neck opening that’s more forward up the mane, a longer drop and a roomier, boxy fit – especially at the tail end where Euro cuts tend to be quite square and extend about 3” off the top of the tail (not including tail flap). This blanket, the Baker Turnout, shows a good view of the back of the blanket & extension of tail flap off the body. The drop refers to how far down his leg the blanket goes. Like the length of a dress, it can be just below his belly, midway to his knees, or to his knees. In this image the black part of the blanket, below the printed body is the drop. Shoulder gussets allow more room for motion & work well for those with big chests or shoulders (think Warmbloods). This Terminator rain sheet very clearly shows a shoulder gusset & a forward neck opening. Euro cut blankets also typically have two crisscross belly straps. The Pessoa Alpine is a good example of a Euro cut blanket. You can see how roomy this blanket is in the hip area; it extends off the tail a few inches & has a tail cover or tail flap. Also available in sheets, this Terminator day sheet is a fine example of a Euro-cut cotton sheet. Please note that even the Euro cut day sheets come with a tail flap. For tall horses, consider the Euro cut to properly protect belly & upper legs, giving room to the shoulders & covering those larger hind ends! Taper cut blankets are sized in 2” increments: 68”, 70”, 72″ and so forth. Taper cuts are contoured through the body especially at the hip. They have a curved cut with the area over the tail contoured back and do not have a tail flap. A wider neck opening allows less contact with mane. The drop is just below the belly. This Big D Grand Prix stable blanket is a good example of Taper cut. This waterproof Terminator light-weight blanket is taper cut as well. Note the larger neck opening, close fit at the chest (no shoulder gussets) and single belly closure with no extending flaps to lengthen the drop. Also available in day sheets to keep your horse clean, this image shows how a sheet can be off the mane (less likely to damage a flowing mane or one that must be banded for shows) & contoured through the body. Consider Taper cut blankets for short to average height horses. Then they’ll be less likely to be overwhelmed by lots of fabric or stepping on a long drop when they get up after a nice snooze!